Summary: Human papillomavirus encompasses a very wide range of virus types that can infect many types of tissue, namely the skin and genital area. Although most HPV infections are generally harmless, some infections can persist and can lead to the development of abnormal cell growth and even cancer. Two studies examining the diet of women and their risk of HPV infection and abnormal cell growth showed that consumption of foods high in beta-cryptoxanthin, specifically the papaya fruit, is associated with lower HPV infection rates and lower risk of cervical lesions. These studies provide increasing evidence for the benefits of consuming papayas, which have also been shown to decrease the risk of breast, lung, and gallbladder cancer. There are over 200 known types of human papillomavirus (HPV). While most types do not lead to any symptoms in people, some types, particularly can lead to lesions and even cancer. Though HPV infections can affect multiple parts of the body, most HPV types fall under two broad categories: infections affecting the skin or the genital area. HPV infection of the skin, termed cutaneous HPV, is very common and generally harmless (i.e., common skin warts). While the majority of genital HPV infections are benign, some persistent types of infection can lead to lesions and even cancer. Although the majority of HPV infections remiss after a short period, some infections can persist, which can eventually lead to the development of cancer. An epidemiological study of over 400 hundred women who tested positive for HPV were evaluated over a one year period . The subjects were categorized into two groups, those with transient infection or with persistent infection, and their diets were carefully monitored. The study found that persistent HPV infection was lower in women who had consumed beta-cryptoxanthin, a carotenoid found in many brightly colored foods. 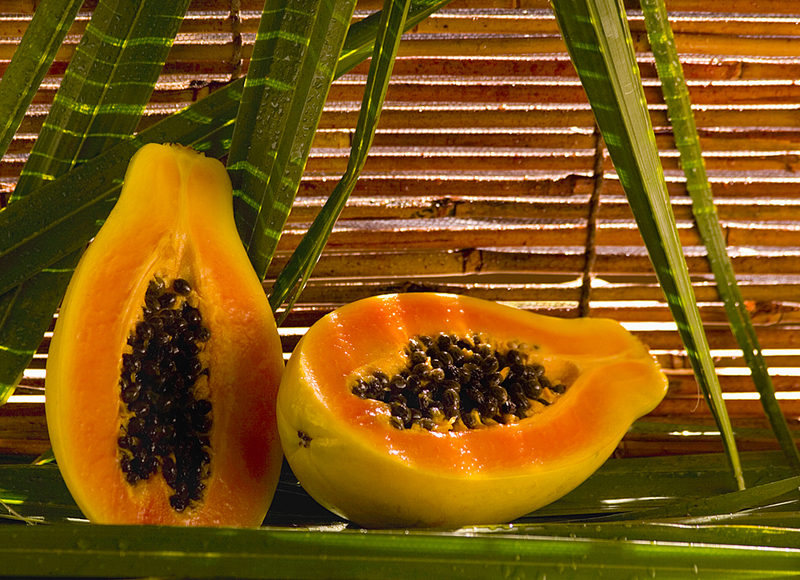 The consumption of one notable food, the papaya, was inversely associated with persistent HPV infection. It is no coincidence that the brightly colored papaya is a rich source of beta-cryptoxanthin. Another epidemiological study conducted in Brazil examined the effect of diet on the development of squamous intraepithelial lesions (SIL) of the cervix . SIL are abnormal growths of epithelial cells in the cervix, and have the potential to become cancerous. Studies have shown that women with HPV infections are at risk of developing SIL. This particular study compared 93 HPV positive women with SIL to 172 HPV positive women without SIL and found that those who consumed more papayas had a lower risk of developing SIL. This is an important finding because under certain conditions, abnormal growth of epithelial cells can lead to cancer. In light of these two studies, it is clear that eating papayas can not only lower the frequency of HPV infection in HPV positive women, but can also reduce the risk of the HPV leading to more serious conditions like SIL and even cervical cancer. Though the mechanism for how papayas can reduce the risk of persistent HPV infection and SIL formation is not entirely known, the key compound beta-cryptoxanthin has been identified as a potential chemopreventive agent. Furthermore, beta-cryptoxanthin and papaya consumption have been found to reduce the risk of other cancers in addition to cervical cancer (e.g., lung, breast, gallbladder cancer). 1. Giuliano AR, Siegel EM, Roe DJ, et al. Dietary intake and risk of persistent human papillomavirus (HPV) infection: the Ludwig-McGill HPY Natural History Study. J Infect Dis 2003; 188:1508-1516. 2. Siegel EM, Salemi JL, Villa LL, Ferenczy A, Franco EL, Giuliano AR. Dietary consumption of antioxidant nutrients and risk of incident cervical intraepithelial neoplasia. Gynecol Oncol 2010; 118:289-294. No recipes yet using ingredients in this article.